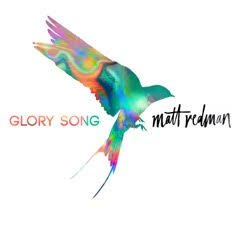 Today, I’m reviewing Matt Redman’s new CD “Glory Song” for FlyBy Promotions. You’re in for a treat because they’re offering one copy of Matt’s CD to one lucky winner! Here’s a note about the album, courtesy of FlyBy Promotions: Matt Redman teamed up with several of his worship-artist friends for this album, first releasing the track “Gracefully Broken (feat. Tasha Cobbs Leonard)”. Tasha Cobbs Leonard also released her own version of this song on the same day! The album also features Kierra Sheard, Guvna B, Madison Cunningham, and Kim Walker-Smith. Ready for my review? Read on! 5 stars = Wonderful! I love it! 4 stars = Great song and lyrics, I really like it! 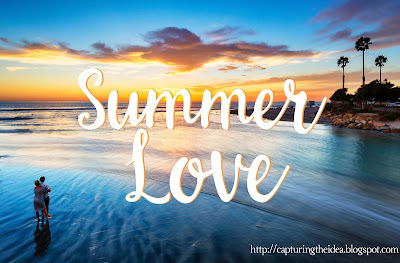 Review: The best way to describe this song is in one word “sunshine” because it shines hope and positivity into your life through its lovely melody and life changing lyrics. It’s life-changing because it reminds you of what really matters in this life as it emphasizes God’s glory in your story that has transformative power. This song encouraged me. Review: This song is about the rugged cross and the gospel message that was born through it. If you’re a Christ-follower and Bible-reader then you know the story. But if you’ve never picked up a Bible and have never heard of Jesus Christ then this song can serve as your first introduction. I didn’t like the tune that much and the rapping segment of the song was not impressive but the message is great. Review: This song was short, sweet and to the point. The singer’s message is clear: God deserves our greatest hallelujah because He is worthy of all our praise. Review: This song was okay. It sounded like they were shouting more than singing though they are talented singers. But the message of this song is a good one and I can appreciate that fact. Review: I like the promise in this song that says that one day, Jesus Christ will make everything right when we all get to Heaven. I love how the singer took a classic church him “When We All Get to Heaven” and added a modern touch suitable for the Contemporary Christian music genre. It is truly beautiful and inspiring! This song has a feather-light touch in its tune. Like it softly brushes up against your soul and lets you know that everything will be okay. Review: This song has a solid message but I didn’t really like anything else about it. Review: “Amply your anthem of grace within my soul” is the opening line to this song and I love it! Draws me in from the start and keeps my ears tuned in until the end. I love how this song gives hope to Christ-followers because the lyrics focus on the facts: Jesus Christ defeated the devil and conquered death. His mission to save our souls is finished! All we have to do now is to believe in God and trust in Him. It renews my hope because it reminds me that the end of human history is simply “God wins”! He will put an end to sin and all of its devastating side effects. God has the final word and HE is victorious over the enemy of humankind. It reinforces my decision to choose God each and every day and reminds me that when I do that, I’m choosing LIFE with the hope of the best happily ever after the end to my life story—an eternity spent in the presence of God. Review: This song really resonated with my soul because it showed me as the listener that yes, I may have questions for God and doubt His goodness when life gets tough BUT God is faithful and He’s never going to give up on me. This song is a steady reminder that God is Good and He can be trusted. It’s also a reminder that God is not scared of honest prayers and can handle raw emotions. He is sovereign and His unconditional love for humankind is eternal. This is perhaps my favorite song on the CD because I’ve been there. I’ve asked God what humans consider “hard questions”. I’ve said I believed then asked God to help my unbelief. I’ve been devastated and distant from Him but He’s always been there. Why? Because He is faithful through ALL of the ages and He’s promised to be there with us until the end of time. Review: The lyrics to this song are very creative and cutting edge. I loved it! The music was upbeat and my only complaint is that the tempo was a bit too fast. It made me dizzy! Nonetheless, this would make a great morning jog routine music playlist. Just pop in your earphones, press play on your music device and take off like the wind! Review: This song holds a very important message that’s told in a deep, multi-layered way and that message simply encourages listeners to hold on to God. Don’t let go of His Hand. Trust Him through the good and the bad. He will carry you through the toughest times of your life. Praise Him through the storms of life and remember that He is always available to be there for you. The melody was soft and sweet. It’s a really nice song. Review: This song is a soft sound and a beautiful reminder of how God wants us to place our burdens on Him and allow Him to lighten our load. It’s a sweet, slow song and throughout the beginning of it, the singer whispers these precious truths into the listener’s ear. But that whisper moves forward on a steady crescendo as the singer drives important truths home. However, the intensity of his singing ebbs and flows according to the impact of the lyrics. He emphasizes the important points then quietly reinforces the faith of the listeners with gentle reminders that God is in control and we can place our hope in Him. Review: I’m not sure how I feel about this song. It’s not bad but it’s not very good. However, the message is succinct and powerful. It’s better than two stars but far from a four-star rating. I think that this is my least favorite song on the entire CD. But this may just be a matter of my personal taste because as I said it has a great message. I just did not connect with the tune. Review: This song encouraged me to keep my faith in God and reminded me of His Goodness. It also touched on the Bible verse about how God’s thoughts are higher than our thoughts and His Ways are perfect and good. Its tune is mellow and its message is heartwarming. What a wonderful way to end this CD! 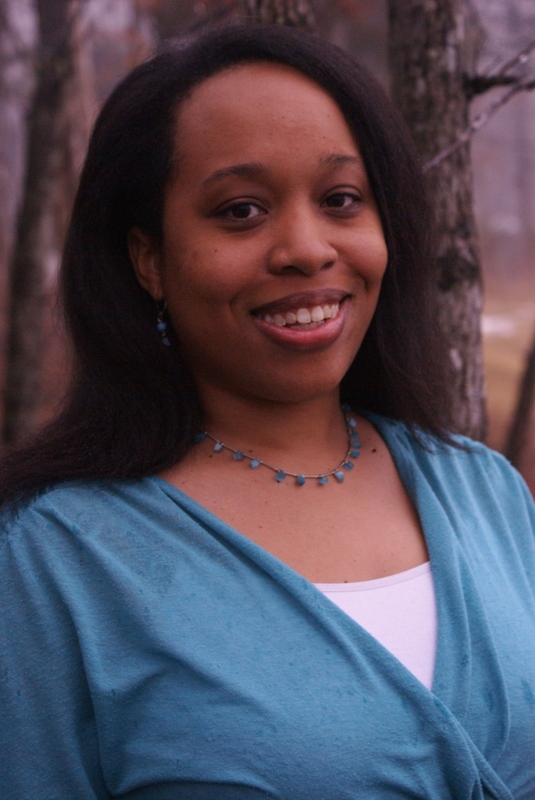 Let's welcome Toni Shiloh to the blog today and congratulate her on her book's birthday! Today is the release of her new novel, Returning Home and she's here to talk about it. Alexis: Why do you call this book, “Returning Home”? Share the inspiration behind the story. Toni: Although this book is about Jo and Evan, it is also about their friends. Half of them return to Freedom Lake for some reason or other. For Evan, he has to return home to heal and even though Jo Ellen is already in Freedom Lake, she returns to the body of Christ and finds home in the kingdom. That’s the inspiration behind the name. The inspiration behind the story happened when I was out driving. I wondered what would happen if someone was in a car crash that caused him or her a limb. Hence what happens to Evan. Alexis: Jo Ellen Baker is the heroine of this story. Tell us about her heart, personality, and outlook on life. Toni: Jo has such a big heart but she’s terrified of anyone seeing it. She hides behind overalls and a hammer. Life has dealt her many blows and she expects them at every turn all the while hoping that luck will grant her favor. Alexis: Evan Carter is the hero of this story. Describe his looks, personality, and most prominent character flaw. Toni: Evan has such a big chip on his shoulder when he first walks onto the pages of Returning Home. Despite that, I love his character. His desire to make amends is one I admire. He’s your average looking guy but his grins and strength of character quickly capture Jo’s heart. Alexis: Describe the setting of this story, Freedom Lake. What makes it special? Toni: The lake! I love water and was so happy to create a setting with that as a backdrop. The book starts in the autumn season so I made sure to throw in some colorful foliage against the lake’s beauty. Alexis: What is a carriage house? How does Jo Ellen’s task of renovating it affect this story? Toni: A carriage house is usually a home built over a garage. Evan needs a place that can accommodate his wheelchair. It’s a central part of the story because it’s how they grow closer together…through the renovation. Alexis: What is it about Evan that Jo Ellen loves? Toni: There is a quietness about him that soothes her. She grew up dealing with drama from her mother and sister. When she’s around Evan she can be herself and relax and have fun. Alexis: What is it about Jo Ellen that Evan cannot forget? Toni: Her strength. He’s always seen her as calm, cool, and collected no matter what is thrown at her. It centers him in the midst of his own storm. Alexis: Why did Evan tease Jo Ellen so “mercilessly” when they were kids? How did Jo Ellen respond to it? Toni: Well, I’ll say sometimes we don’t handle attraction well. I don’t want to give it all away so I’ll leave it at that. Alexis: Why does Evan have to return home and move in with his parents? How does he feel about this situation? Toni: Oh he absolutely hates it! What grown-up wants to return home and end up living with their parents? He feels like a failure and doesn’t handle the situation very well. Alexis: What role do Evan and Jo Ellen’s faith in God play in this story? Toni: Evan has forgotten his faith in the midst of tragedy. Jo refuses to participate in a faith that seems hypocritical. Both have to come to terms with what is real versus what they believed to be true. Alexis: What was your greatest challenge in writing this story? Toni: Hoping that I was true to each character and their own issues they needed to overcome. I’ve never been in either situation so I had to pull on empathy and research. Alexis: What about writing this story brought you the deepest joy? Toni: The End! This was the first full-length novel I wrote and I felt such an accomplishment when I completed the first draft. Alexis: If you were a counselor to Jo Ellen and Evan in this story what would you say to help? Toni: Your attitude can make or break your day. Often times are pessimistic beliefs and thoughts create an unhealthy environment that is our own undoing. Alexis: What do you want your readers to remember most about Returning Home? Toni: That no matter where you are on life’s journey, God can see you through. Alexis: Thanks for the interview, Toni! Would you like to share closing thoughts? Toni: Thank you to all who have followed me on my writing journey. I couldn’t do this without your support and prayers. May God bless you as you have blessed me. 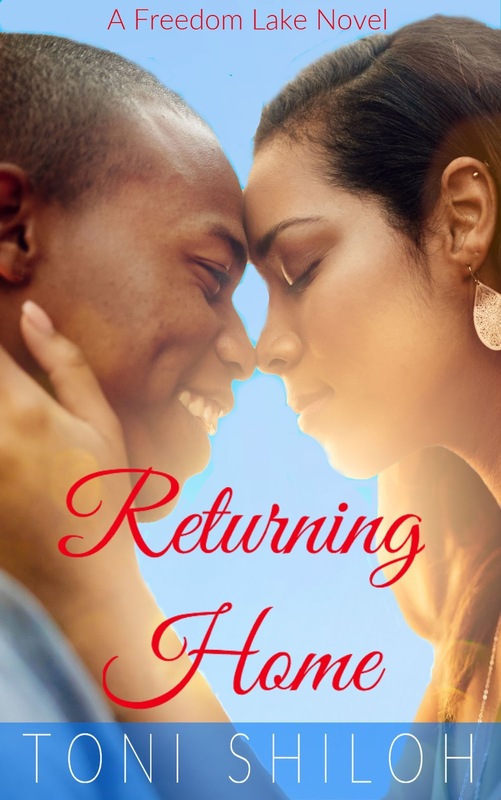 Blurb for Returning Home (book): Jo Ellen Baker is shocked to find out that the boy who teased her mercilessly throughout high school, has returned to their hometown of Freedom Lake, and he’s missing a leg. When his mother asks her to renovate their carriage house to give him a place to gain his independence back, she wants to say no. But one look at him brings a rush of forgotten feelings. Evan Carter can’t believe he has to return home and live with his parents. Every hope and dream he ever had dissipated in a car crash that cost him his leg. Stuck in a wheelchair, he’s forced to re-examine his relationship with God and the local carpenter, Jo Ellen Baker. In 2012, I thought my life was falling apart. I had never expected to get divorced, but there I was, bitter, angry, hating myself, and completely spoiled on the idea of love. My eight-year relationship had taken a turn for the worse about a year and a half before then. I had opened a successful business, followed my dreams to write my first novel, and become a stronger, truer version of myself. My ex, he didn’t like that so much. I will spare you all the details, but just understand I found myself completely wrung out, broken, and frail. I was at my worst, my weakest, when my true love finally found me. He, too, was at his worst, his weakest. He was actually contemplating suicide. It was bad. But we found each other. I wanted to date and have some fun, so I joined Match, Zoosk, eHarmony, all that stuff. And there I found Falcon, a writer like me, cuddling a gorgeous husky dog in his profile pic. And so I reached out . . . as friends. I wanted a writing partner, not a life one. But then the strangest thing happened. We met, and even though I still had relegated him to the friend box, I knew instantly that I wanted him in my life forever. Feelings like that don’t just happen every day! We became friends, good friends, best friends, and then less than a month later, one glorious Labor Day weekend, we shared our first kiss. And on December 1 that same year (yes, less than three months later! ), we got married under the gazebo in a tiny park by our house. There were no bells, no whistles, no pomp or circumstance. Just love. Four years later, here we are celebrating our anniversary. Still in love, still facing battles in our lives, but also fighting together. I don’t know where I would be today, don’t know who I would be, if not for Mr. Storm. He doesn’t just make me a better person. He makes me myself, the person I actually am inside. Do you know how freeing that is? I hope and I pray that even if you haven’t found it yet, you will one day soon. Never settle for someone who suppresses your shine, who looks down on your accomplishments or mocks your interests. Don’t let anyone tell you that you are not good enough. 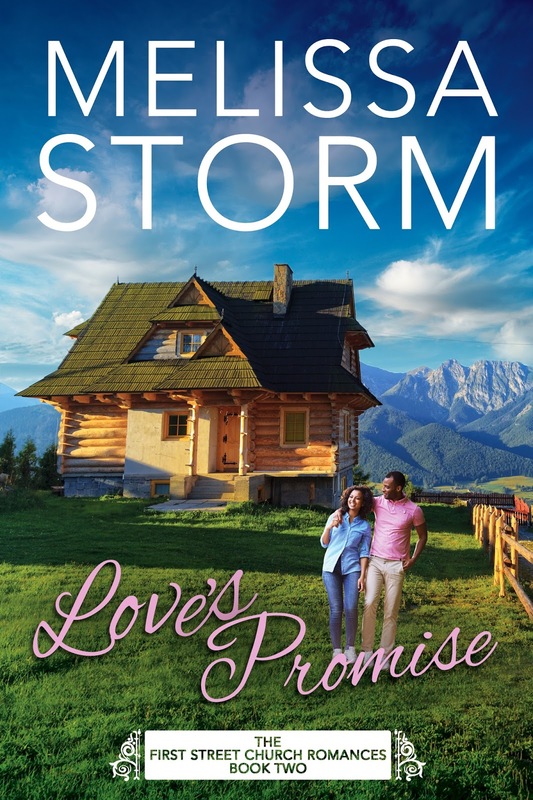 Hold out for your Mr. Storm, your happily ever after. Because, honey, he is out there, and once you find him, everything gets brighter. Melissa loves books so much, she married fellow author Falcon Storm. Between the two of them, there are always plenty of imaginative, awe-inspiring stories to share. Melissa and Falcon also run a number of book-related businesses together, including LitRing, Novel Publicity, Your Author Engine, the Author Site, and the Alliterates. When she's not reading, writing, or child-rearing, Melissa spends time relaxing at home in the company of her five dogs, cockatiel, and a rescue cat named Schrödinger. She never misses an episode of The Bachelor, because, priorities. Blurb for Love's Promise (book): Kristina Rose Maher wants to know why fairytales never happen for fat girls. Certain that diner cook Jeff, handsome and fit, will never want her as more than a friend, she stuffs down her attraction to him. But when she finds herself facing a life-altering weight loss surgery, she discovers she's willing to do whatever it takes to embrace life—and love—to the fullest. Happy first day of Fall 2017! I love this season because of the cool breezes, soft sunshine, gorgeous changing colors of the tree leaves, caramel apple cider and the fact that it's the perfect time to wear boots. 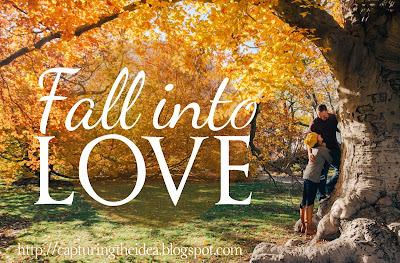 This year, I'm excited to introduce a new series for my blog titled, "Fall into Love." 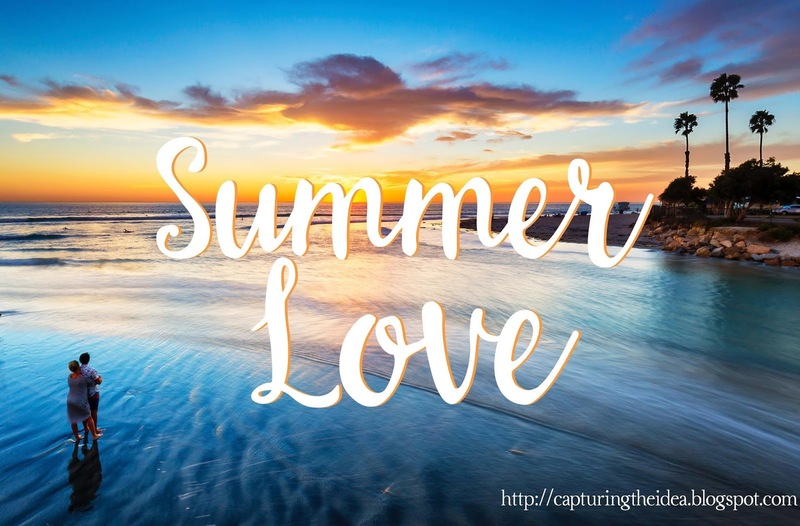 It's a weekly series featuring real stories about how my author friends first fell in love with the person they married. Every Sunday for all of Fall 2017, you will find a new feature on my blog. Some Sundays, you'll receive a bonus that includes a blurb for the featured author's book and a fun book giveaway contest! However, since not all of the authors are published yet, so on their Sundays you will only read about their real-life love story. There is a chance that I'll feature some authors who ARE published but NOT married yet so on those Sundays, the focus will be on their book and giveaway contest. 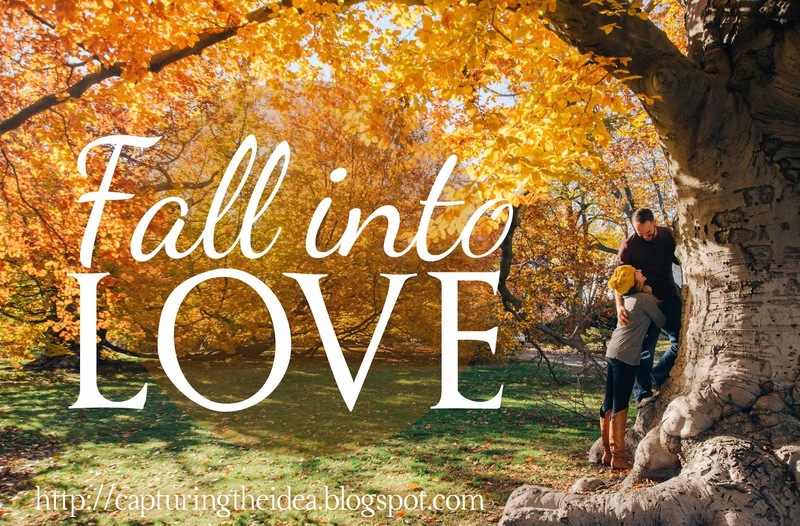 All of the books featured in this Fall into Love blog series will be pure romance fictional stories. You are encouraged to interact with the authors by writing notes to them in the comment section toward the end of their blog posts. Just like readers love receiving free books, the authors who give away those free books love to hear kind words from their readers! :) So let's encourage the hearts of these creative people who you will "meet" during the span of this series. 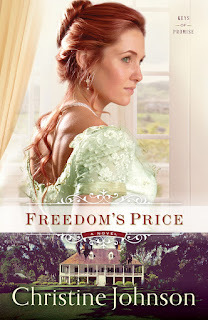 Character Interview with Tom Worthington of "Freedom’s Price"
Alexis: Hi, Tom! How are you today? Are you happy with the way that your author Christine Johnson wrote your story? Inquiring minds want to know. Tom: Hi. I gotta admit that it’s pretty peculiar to get interviewed. Did you say this was for a newspaper? I haven’t met many lady reporters. Uh, what did you ask? Oh yes, if I’m happy with the way my story came out. Well, there are parts I’d rather the world didn’t see, if you know what I mean. I’m a bit ashamed about some of the grudges I held onto. And in retrospect I’d make a few choices differently, given the chance. Alexis: What is the price of freedom in your story? Tom: [Shrugs] I guess the cost means letting go of what you want most. Alexis: What is your motivation? Tom: Restoring the Worthington name, plain and simple. There were a lot of lies flung out over the years. It’s time to set things straight. Alexis: Who stole your father’s ship and set him adrift at sea? How did that make you feel? Tom: Luis Mornay incited the crew to mutiny and stole the ship. Of course we didn’t know a thing about it until Pa drifted to shore far to the south and made his way home to Nantucket. Pa tried to set the record straight but the ship owners wouldn’t listen to the truth. They wanted to blame someone. Since Mornay wasn’t there, they blamed Pa and took everything he had, even our house. They broke Pa, stole his dignity. I’ll never forget that. Alexis: What role does forgiveness play in your story? Tom: You think I should forgive Mornay—or whatever he calls himself now. [Long pause] I suppose I should. They say forgiveness is for yourself, not the villain who hurt you, but it’s tough. I’ll forgive, but forget? I don’t think I’ll ever forget. Alexis: The bravery and beauty of this story’s heroine, Catherine Haynes, has you at hello. Why? What is it about her that touches your heart? Tom: [Grinning] You’ve seen her. I know you’re a lady and all, but you have to admit she’s gorgeous. That red hair of hers… [sigh] I should have realized the hair matched her temperament. Spunky, bold, decisive. Who wouldn’t be drawn to her? Alexis: Why do you fear for Catherine’s safety? What measures do you take to protect her? Tom: All those great qualities of hers also make her headstrong. Once she’s decided on a course of action, she doesn’t deviate—even if holding course is dangerous. She’s a bit naïve about the dangers she faces as a woman alone in the world. With no male relations, she needs someone to step in and protect her. I’ll make sure no one lays a hand on her, even if it means hounding her every step. Alexis: Who is Rourke O’Malley? How did he lead you to Jesus Christ? What were you like before you met him and became a Christian? Tom: Rourke is my commander, the owner of the O’Malley fleet. When I first came to Key West, he rescued me from a duel spurred on by my temper. The man would have slaughtered me if Rourke hadn’t stepped in. Rourke took me aboard his ship and showed through his actions how living for Christ changes a man. That’s when I first realized that fighting wouldn’t bring me respect. Character, integrity, and adhering to Christ’s way; that’s what matters. Rourke showed me I could look forward at all that God promises instead of back at the troubled past. Not that I have it all down yet, mind you. Alexis: Who is DeMornay? Why do you think that he might harm Catherine? Tom: Luis Mornay. Louis DeMornay. The names are too similar. If DeMornay is Mornay, then he will stop at nothing and no one to get what he wants. If Catherine marches in there thinking she’ll be in charge, she’s asking for trouble. He will use it against her. I have to protect her. Alexis: What would you say was your “black moment” in this story? Why? Tom: When I thought Catherine might be dead…all because I delayed getting to her. I’ve never felt so sick. Alexis: If you could change one thing about your story, what would it be? Why? Tom: Sometimes I think I should have told Catherine my suspicions from the start. Maybe she wouldn’t have gone to Louisiana. Alexis: How do you want to be remembered by your readers? Tom: [grinning, a twinkle in his eye] As a dashing hero, of course. Alexis: Thanks for the interview, Tom! Would you like to share closing thoughts? Tom: Thanks for reading my story. I hope you like it! Christine Johnson loves history, especially when it centers on ships and the sea. 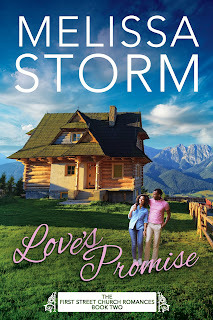 In addition to her Keys of Promise series with Revell, she has authored a dozen books with Steeple Hill and Love Inspired. She and her ship captain husband split time between the shores of Lake Huron and the Florida Keys. 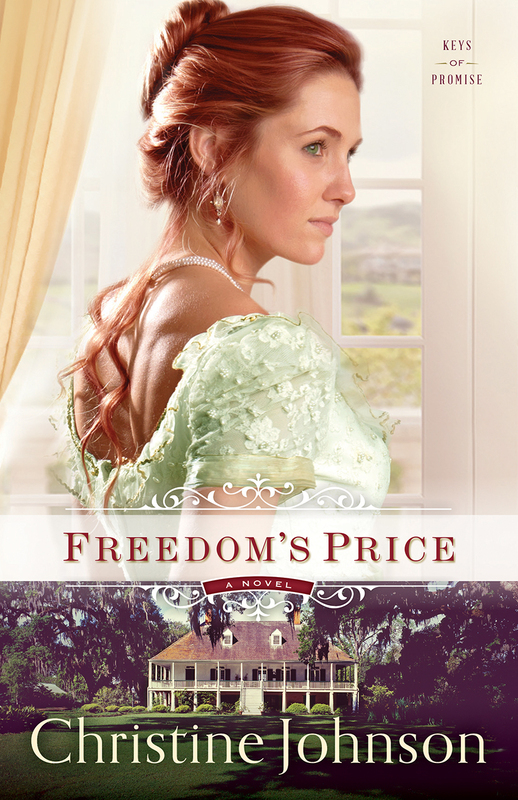 Book blurb for Freedom’s Price: When Englishwoman Catherine Haynes loses both her father and her home in 1856, she decides to cross the Atlantic to find her American mother’s family in Louisiana. She enlists the help of Tom Worthington, a dashing Key West man who makes his living salvaging wrecked ships. When Catherine arrives at the plantation, she finds that her family has left it in the care of a manager—who’s let it fall into disrepair. Torn between returning to Key West with Tom and beginning the hard work of restoring the plantation, Catherine soon finds herself snared in a plot to steal her inheritance. When an incredible secret comes to light, both she and Tom will face a choice: grip their dreams ever tighter or step forward in faith—even if it costs them everything. Alexis: Katherine, why did you think your boyfriend Henry Jorgensen was going to propose to you? Describe how you felt when he dumped you. Katherine: Henry and I had been dating exclusively for nearly a year. He was a regular guest at our home for meals and family events. When he asked me to dinner at the new, fancy restaurant in town I assumed it was because he felt the date was a special occasion, and what’s more special than a proposal? I was heartbroken and embarrassed when he broke up with me. I felt like it was my fault that he was dumping me. Alexis: Why did you decide to become a Harvey Girl. What was that experience like once you started working for Fred Harvey’s company? Katherine: My mother was a Harvey Girl and loved it. She thought if I started over somewhere, it would be good for me, and I agreed. I was very nervous in the beginning. I had heard that Mr. Harvey’s son who ran the company was very exacting. I wasn’t sure I would be able to make the grade, but my boss, Miss Stewart was an excellent teacher, and I learned a lot. It was a very positive experience. Alexis: Who is Pamela? Why did you think after a scene that she was out to get you? Katherine: Pamela is one of the other Harvey Girls, and she seemed intent on creating difficulties for me and for making me look inept. Several times she made me spill or drop things in a way that seemed to be my fault. When Miss Stewart reprimanded me, Pamela didn’t own up to her part in the incident. Alexis: What makes Eunice such a good friend of yours? How did she help you cope with your heartbreak that Henry caused? Katherine: Eunice is a sweet, giving person. I met her on the train to Arizona, and she helped me get over my nerves of starting the new job by reminding me that I wouldn’t have been hired if the company didn’t think I could do the job. Her excitement for the opportunity was contagious. She also helped me focus on the new job, and when she became a Christian she encouraged me to pray about my hurt feelings. Alexis: How did becoming Head Waitress for the Harvey Girl Company change your life? 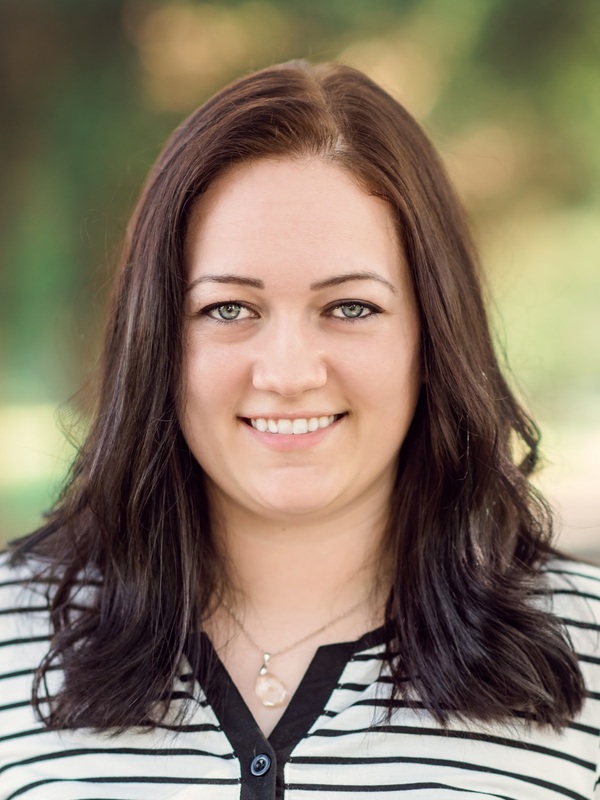 Katherine: Other than a classroom, I had never been in charge of anything, and it never occurred to me that I could hold a leadership position. Being promoted to Head Waitress gave me a tremendous amount of confidence because I gained additional skills and abilities that I could use throughout my life. Alexis: How did you deal with the backlash from some of your colleagues who were jealous about your job promotion? Katherine: Initially, I wasn’t very mature about their behaviors, and I became aloof and standoffish to them. Eunice helped me see that the way I was acting exacerbated the situation, and she encouraged me to be firm and fair, but also friendly. Eventually, that made the relationships less contentious. Alexis: Who is Alice Jorgenson and why were you hesitant about working with her? Katherine: Alice is Henry’s sister, and our families have known each other for a long time; since all of us were children. I thought she would expect special treatment because of that relationship, that I would overlook any errors she made or poor performance. My hurt feelings also seemed to surface every time we were in the same room, and I didn’t want to have to deal with that every day. Alexis: How did you like your life in Arizona working as a Harvey Girl? Katherine: The geography of Arizona is very different from that of Ohio, and I wasn’t crazy about the heat, but it is a beautiful state in its own way. The Grand Canyon is magnificent, and Red Rock Country is intriguing. Because I loved my job, I loved being in Arizona. Alexis: Did you miss your home in Ohio? Why or why not? Katherine: My family is very close-knit. We shared everything, so being far away from them was difficult. We wrote lots of letters to each other, but it’s not the same as being together. I missed them very much. I also missed my friends, but the excitement and enjoyment of being a Harvey Girl kept me busy enough that I didn’t get homesick too often. Alexis: Is there hope of a happily ever after for you and Henry? Why or why not? Katherine: Readers will have to wait and see! Alexis: What was the most devastating part of leaving home to work in Arizona? Or was it an enjoyable experience for you? Explain. Katherine: It was hard to leave my family behind to strike out on my own. As I said, we are very close, so it was difficult being apart, but because I made new friends that I still keep up with, and gained confidence and new skills, it was a wonderful experience. Alexis: What lessons did you learn while working in Arizona? Katherine: I learned that God is in control and has our best interests at heart. He loves us no matter what our shortcomings. Alexis: Would you say that your experience as a Harvey Girl and Head Waitress made you stronger? Why or why not? Katherine: The experience working for the Harvey Company definitely made me stronger. I learned how to work quickly and efficiently. I gained the ability to juggle multiple tasks and how to work with people who may be different than me. I am able to be on my own and make my own decisions. Alexis: What’s the moral of your story? Katherine: God is a God of second chances. Alexis: Thanks so much for the interview, Katherine! Do you have any closing comments? Katherine: Thanks for speaking with me! I hope readers will enjoy my story, discovering the role Harvey Girls played in taming the West. 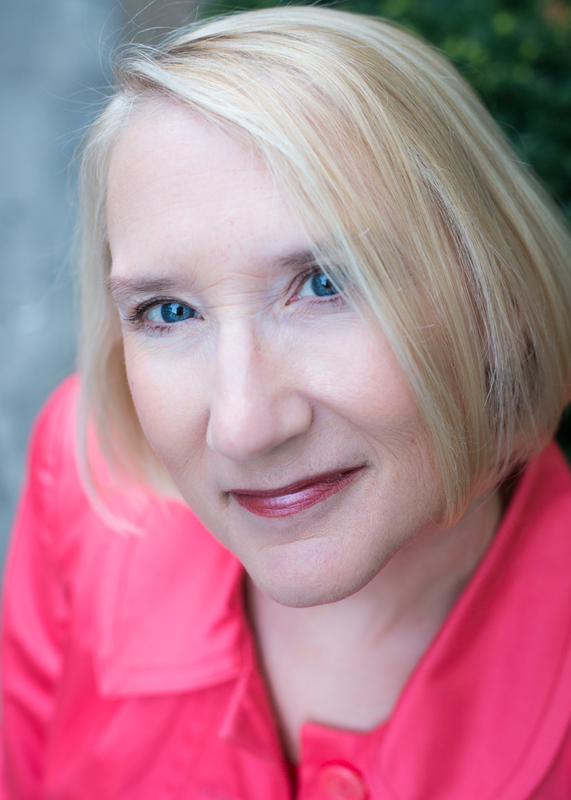 Linda Shenton Matchett is a journalist, blogger, and author. Born in Baltimore, Maryland a stone’s throw from Fort McHenry, Linda has lived in historical places most of her life—from Edison, New Jersey (named after the famed inventor of the lightbulb) and Washington, D.C. to Wolfeboro, New Hampshire (reputed to be the oldest summer resort in America). 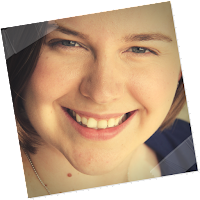 A freelance writer for over ten years, her articles and devotionals have appeared in numerous print and online publications. A varied career has included stints as a crisis counselor, human resources professional, bed and breakfast owner, and youth center director. She is currently the Front of House and Catering Manager for a boarding high school. 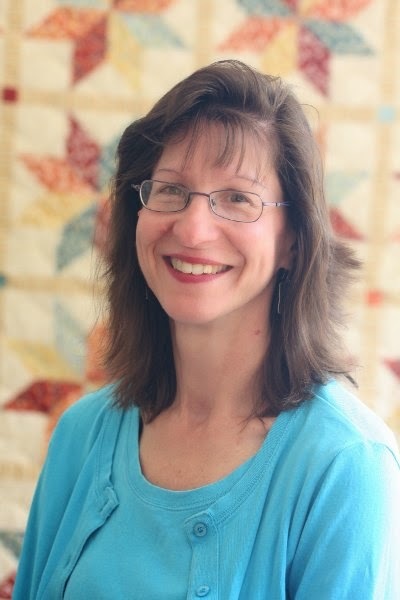 She volunteers as a docent at the Wright Museum of WWII and as a Trustee for the Wolfeboro Public Library. 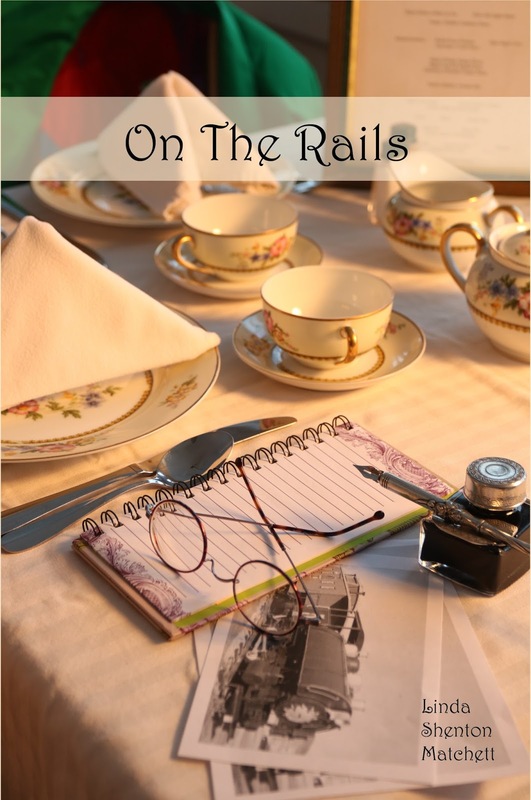 Book blurb for On the Rails: Warren, Ohio, 1910: Katherine Newman loves being a teacher, but she loves Henry Jorgensen more, which is why she’s willing to give up her job to marry him. But instead of proposing, Henry breaks up with her. Devastated, Katherine seeks to escape the probing eyes and wagging tongues of her small town. A former Harvey Girl, Katherine’s mother arranges for Katherine to be hired at the Williams, Arizona Harvey House. Can she carve out a new life in the stark desert land unlike anything she’s ever known? Henry Jorgensen loves Katherine with all his heart, but as the eldest son of a poor farmer can he provide for her as she deserves? The family’s lien holder calls in the mortgage, and Henry must set aside his own desires in order to help his parents meet their financial obligation. But when Katherine leaves town after their break up, he realizes he’s made the biggest mistake of his life. Can he find her and convince her to give their love a second chance? 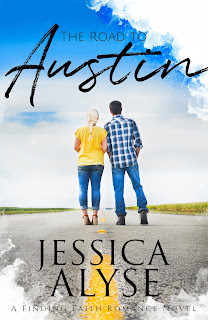 Jessica Alyse returns to the blog today with a fun interview featuring Natalie Hallie, the leading lady (character) from her new novel, The Road to Austin! I found this book to be poignant, multilayered and complete with solid storytelling skills by its author. 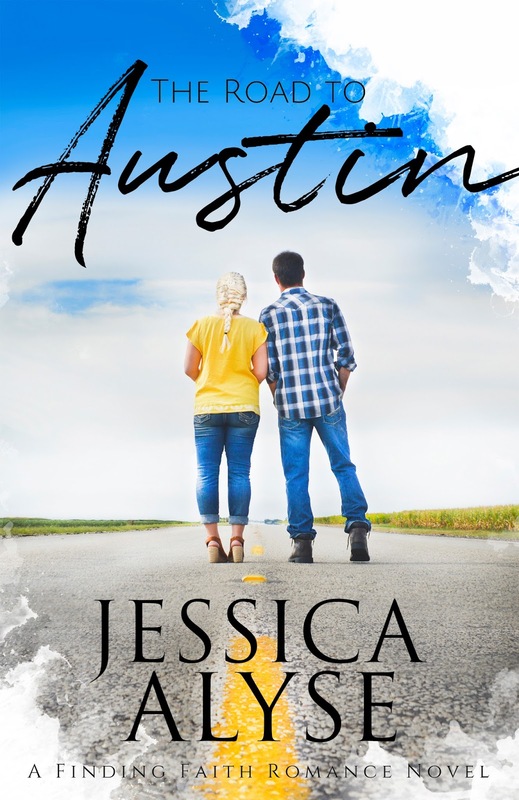 It's evident that Jessica Alyse has a passion for writing stories that are solid, relatable and don't shy away from tough topics. Remember to enter the book giveaway contest toward the end of Natalie's interview, for your chance to WIN an e-book copy of The Road to Austin. Alexis: Natalie, your author pegged you as a “woman on a mission.” Do you agree? Why or why not? Alexis: Your goal is clear: Get home in time for your sister’s wedding. You try to fly in an airplane but fail. So then you’re resolved to take a road trip with a man (Austin Brooks) whose love for spontaneity gets underneath your skin. Why? Natalie: If I’m being honest with myself, Austin is really the only man I trust – for reasons I’m sure you know after reading our story. It is absolutely true that he gets under my skin at times, I mean the man lives life by the seat of his paint-stained jeans – whereas I do not. But Austin has a gentleness about him, an assurance, if you will, that he’ll be there for you no matter what. When I realized taking a plane wasn’t going to be an option for me, having Austin show up out of nowhere and offer to drive me home…it was the best thing that could have happened to me. Alexis: Growing up, you and Austin were friends. What made you drift apart? How did you feel about reconnecting with him on this road trip? Natalie: I wouldn’t say we were really friends – although the younger me would have loved it if we were. If it were up to me, Austin and I would have never drifted apart. Back when we were both eighteen, things happened in our lives that would take a lot of time to overcome – ten years to be exact. It was hard to let him go and let him find his own way in the world. It created a lot of resentment and confusion in me. When God opened the door for us to reconnect, I was hesitant because I thought I was still angry with him for leaving. I didn’t want to hurt again. And I certainly didn’t want to revisit those old feelings. But God had other plans for us, and I’m grateful we were able to travel that road back to Austin, Texas. Alexis: Describe The Road to Austin. If you could sum up your journey in just one word, what would you say? Why? Natalie: One word? I would have to say…beautiful. I think that perfectly sums up our journey because it perfectly sums up who Austin is. That’s really what this journey was about; getting to know Austin’s heart all over again. All this time I thought I was trying to get home to Austin, Texas. But now that I look back on it, there was more to it than that. As it turns out I found my home in him. In Austin Brooks. Alexis: What was your most memorable moment on the road to Austin? Why? Natalie: I remember it vividly, it was the first time Austin held me right after we heard about the plane crash…I still get chills thinking about that day. I was a mess, shaking and crying, I couldn’t get a grip on reality. And he was there, holding onto me, keeping me strong and helping me stand. I don’t want to think about what would have happened if he hadn’t been there. If he hadn’t been who he is and randomly offered to drive me home…I wouldn’t be here if it weren’t for Austin. He saved my life without realizing it. Alexis: What were your first thoughts when you found out that Austin is an artist—a very talented one? Natalie: I was blown away. I had no idea he was capable of that kind of emotion. The thing is, Austin comes over as this man who doesn’t care or who doesn’t take life seriously – but the truth is, he sees the world differently than the rest of us. He sees people differently, with a love that I think can only come from Christ. That’s what you see in his art. It’s not just pictures and paintings. Austin pours his soul into everything he does and to witness that firsthand in his art, you can feel the passion. It’s inspiring – that’s probably an understatement. Austin makes you want to be a better person. That’s what makes him Austin. Alexis: Austin wants you to lighten up and not take life so seriously. Why? Natalie: Austin is aware of how rigid I can be at times. I like to adhere to a schedule and stick with a routine. I’m very much a perfectionist and when things are out of order, I tend to stress out and take the fun out of life. He hates that. Austin is all about fun and finding something to laugh at and admiring the simple things in life. I don’t always remember to slow down and appreciate it. We make an amazing team because his colorful outlook on life reminds me to breathe and my knack for details reminds him to stay on track. He keeps my head in the clouds and I keep his feet on the ground. Alexis: Three days was enough to go full circle in your relationship with Austin. How did he go from annoying you to melting your heart? Natalie: It was all in my perspective. The first time I set foot in Austin’s truck, I was a hard, cold person. Everything in my life had led me to think there was no hope in life. That’s why I found Austin so annoying. Because his sense of adventure is built on a foundation of hope. He sees only the good – whereas I could only see the bad. This road trip really wore us both down emotionally, the broken deadlines and never-ending problems and all of the life-and-death situations, we were tired and drained, so we dropped our guards and really got to see the other for who we were. We saw the worst and best of each other and those are the parts we fell in love with. Once I could see his strengths and weaknesses side-by-side, I knew no other man could compare to Austin. I wanted to spend the rest of my life with him. Alexis: Would you say that you love Austin? If so, describe how he won your heart. Natalie: Yes, most definitely. Truth be told, I’ve always loved Austin. Since we were eight. I would say he won my heart by just being himself, but that’s so cliché. He won my heart when I realized I’d found someone who wanted to hold me gently. Someone who was appalled at the idea of seeing me hurt, after all I’d been through, and who wanted to show me what love really felt like. His touch goes through my skin and runs into my soul. He’s healing parts of me that had been destroyed. I can feel it every day. Alexis: What is it about your past and Austin’s past that used to bother you? Natalie: His leaving ten years ago. I think that’s where my resentment started to grow from. All of my life – my young life – I thought I’d found someone I could lean on, someone who could protect me if given the chance. But when Austin left home, he took that hope with him and left me reeling for security. I had to find my footing after this foundation of my childhood dreams had been ripped out from under me. Truth is, it wasn’t healthy for me to live in that world. It took tearing our lives apart to build us both from the ground up. Seven years after Austin left, I was tired of falling apart so, as a last ditch effort, I decided to mimic the faith I always saw in Austin. I quickly found out that faith can’t be mimicked, but it can be inspired. When I gave myself to Jesus Christ, faith became my own, something to cherish and nurture. Austin’s faith may have led me to that point in my life, but it couldn’t save me. It took knowing Jesus for myself to realize there were greater things waiting for me. Alexis: What role does faith in God play in The Road to Austin and beyond? 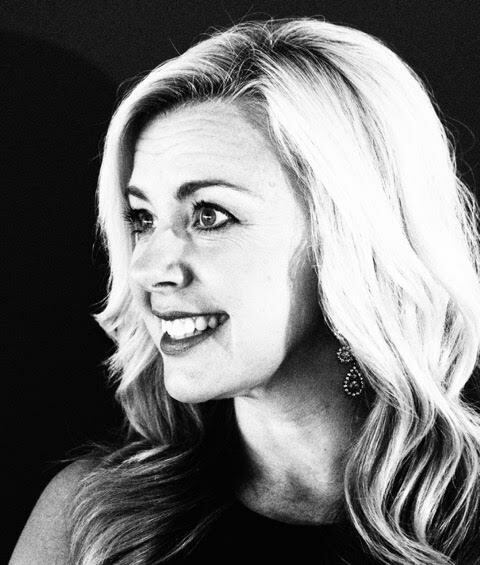 Natalie: Our faith in God is most definitely the foundation of our story, of our future. But I would say, more specifically, it’s our hope in God that keeps us living, breathing. I had no problem trusting in Him when I was still a hard and bitter person. But it’s the warmth of His hope that melted my cold walls. He used Austin to set my focus on better plans and sweeter dreams. Every day I get to wake up knowing He has a plan and purpose for me. That’s hope. Alexis: If you could do one thing differently in your life, what would it be and why? Natalie: This might sound crazy, but I would have to change my career. If given the chance, I would have pursued photography from a very young age. But it was because of my father’s desire to have a family of lawyers that I chose his course and went to law school. Some might think I would change being born into a loveless family, but not meeting Austin isn’t something I would risk. Alexis: What do you want readers to learn from your life story? Natalie: Hope exists. Keep your chin up and eyes on Jesus Christ. Never give up on hope, I don’t care what happens in the world. True love also exists. Austin is proof of that. If that kind of loyalty and passion lives in the heart of one person, then it exists in the world and is worth waiting for. Nobody is perfect, but the love that God puts in your heart for that one special person is enough to carry you through a lifetime of tests and trials. Just hold onto each other. Alexis: Thanks for the interview, Natalie! Would you like to share closing thoughts? Natalie: Only that this was fun and I hope to do it again soon. Blurb for The Road to Austin: Natalie Hallie is a woman on a mission. Can you imagine? First, falling asleep in a very public place. Secondly, literally tumbling backward through an open window. Thirdly, landing dead on the ground? Poor Eutychus. Just a young guy trying to catch some z’s. Have you ever unintentionally fallen into that blissful state of slumber whilst in public? You try desperately to keep your eyes wide open, but your eyelids are like lead. Why is it so hard to stay awake sometimes? Especially in our Christian walk. Like when we try to pray or attempt to stay focused on the message being preached, or reach a place where our corporate worship is ablaze and genuine. When we are at home and have the best intentions to follow a Bible devotion plan, or journal our thoughts, or get through a challenging book. Why is it so much easier to take a nap? Spiritual sleeping is a dangerous pastime, and we do it well. In the comfy western world, we Christians are in dire need of some shaking. It’s a scary thing to even write because we rather like our non-confrontational, peaceful, easy-going faith. But while our eyes are closed WE ARE MISSING OUT ON SO MUCH. To be affected with the Word of God, we need to be physically and spiritually awake. Eyes wide open. There has to be a hunger, a drive, a desire to follow where God leads, to obey His command, to seek His face. The Bible isn’t an optional extra for our faith-walk—it isn’t a reference book to consult whenever the need arises. It’s our daily bread. Our sustenance. And when we are truly IN the Word, we won’t be caught napping on a windowsill. Our story with young Eutychus has a happy ending (as long as you are good with being remembered as the guy who fell asleep while Paul was preaching, back-flipped through a third-story window, and died). I’m sure there was a ruckus when the packed household of believers realized what had occurred, but Paul was on the case immediately. By God’s grace, a miracle was performed when Paul “fell on the dead body and embraced it” (verse 10), bringing the boy back to life. Don’t you just love it when God uses even the most unfortunate of events to bring glory to Himself? What a crazy miracle! Friend, do you need a wake-up call? I know I do. Regularly. The Almighty doesn’t need me to be awake with eyes wide open in order for His perfect plan to evolve. He has the power and authority to do anything He pleases with whomever He chooses. But I want my heart to be affected with the Word and my eyes wide open to what God has in store. How about you? Laura is a published Christian author with a heart for inspiring and encouraging readers of all ages. 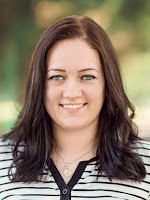 She is truly multi-genre—with a published Christian teen fiction trilogy, marriage book, children’s stories, devotionals for Union Gospel Press, musings on her blog, and she now has a literary agent representing her Christian romantic suspense novel. Laura is English and Canadian, married to her high school sweetheart, mom of three, passionate about faith and family…and chocolate!